In response to the call for engagement by Manitobans in the development the 2019/2020 Provincial Budget, CCEDNet-Manitoba prepared a brief with 15 recommendations in four themes, guided by our member created and endorsed policy resolutions. Our brief was sent to the Honourable Scott Fielding, Minister of Finance. The Province has a website indicating ways you can participate in these important consultations. 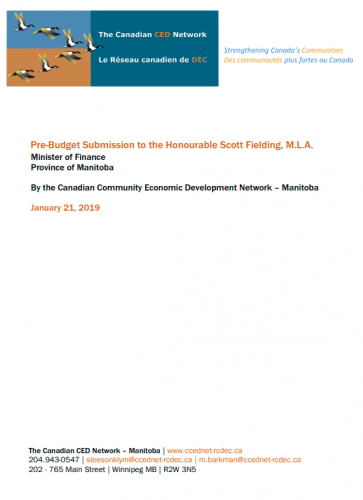 To learn more, or to find out how you can use this document to draft your own pre-budget submissions, contact Michael Barkman at m.barkman at ccednet-rcdec.ca or 204.943.0547. Our public policy mandate is decided through a democratic, member-driven process. Members of the Canadian CED Network - Manitoba submit draft policy resolutions that are subject to a deliberative process and those adopted are the focus of outreach by the entire CCEDNet Manitoba membership. Read our full policy mandate here. The recommendations in this submission reflect solutions already working in communities and are the result of a democratic decision-making process. Reverse the trend towards increasing child apprehension and the number of children and youth in care, and focus on meaningful employment for people with barriers to employment. Partner with and support social enterprises that provide wrap-around supports for individuals and families involved with Child and Family Services, and re-invest the savings accrued through reductions in child apprehensions into community-led, poverty reduction priorities. Support organizations and initiatives providing long-term supports to Indigenous job seekers facing multiple barriers to employment and employers committed to inclusive hiring. Ensure that community employment benefits are reported on for projects where the provincial government is the ultimate recipient of federal government infrastructure funding. Invest in childcare and early learning as a crucial part of economic inclusion and access to employment for Manitobans. Create 17,000 new, licensed, and funded not-for-profit early learning and childcare spaces, while also investing resources to ensure existing spaces are sufficiently funded. Release a comprehensive poverty reduction plan. This plan must be developed in consultation with community members and include targets and timelines for reducing poverty. We believe The View From Here provides a blueprint for this work. Introduce a new livable basic needs benefit to lift all Manitobans up to or above the poverty line. Establish a fee waiver system that enables low-income Manitobans to obtain or replace a birth certificate free of charge. The report Access to Identification for Low-Income Manitobans provides a blueprint for this work. Partner with the Canada Revenue Agency (CRA) to better administer the 55 PLUS Manitoba Income Supplement and the Manitoba Child Benefit, particularly focusing on automatic assessments through the CRA. Invest in social and affordable housing, as well as committing to the Rent Assist program, through the recommendations of the Right to Housing Coalition. Support social enterprise development in Manitoba by committing to co-creating and co-producing a second phase of the Manitoba Social Enterprise Strategy beginning in 2019/20, with a mission of supporting social entrepreneurs focused on job creation and training for people facing barriers to employment. Build upon commitments to strengthening the co-operative sector by mobilizing existing resources and developing new resources in full partnership with the co-op sector to best serve the co-op development needs of Manitoba. Increase the grants provided to third party not-for-profit business and enterprises support services to 2016/17 levels so that low-income and rural Manitobans can receive robust and timely access to accessible business, cooperative, and enterprise development training and consulting services. Explore innovative social finance options in partnership with the Winnipeg Social Finance Working Group, including reviewing existing social finance policy and programming, and maintaining the budget allocation to the CED Tax Credit. Implement a Government of Manitoba Social Procurement strategy that generates additional value through enhanced economic, social, and environmental outcomes, while increasing purchasing from social enterprises, cooperatives, and nonprofits; local and sustainable food; and increasing job and training opportunities for people facing barriers to employment. A targeted approach that identifies and invests in key neighbourhoods and communities in the greatest need of physical, social and economic revitalization. Renew Manitoba’s community development programs; both honouring long-term, core funding commitments to Neighbourhood Renewal Corporations and considering potential efficiencies and red tape reducing measures, in consultation with impacted organizations and communities. 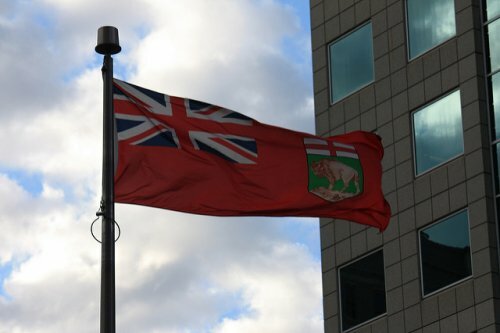 Creating effective communication channels between the Province of Manitoba and community-based organizations, allowing agencies to provide feedback and make recommendations, as well as providing agencies with a year’s notice of renewal decisions, thereby ensuring agencies have sufficient time to plan.